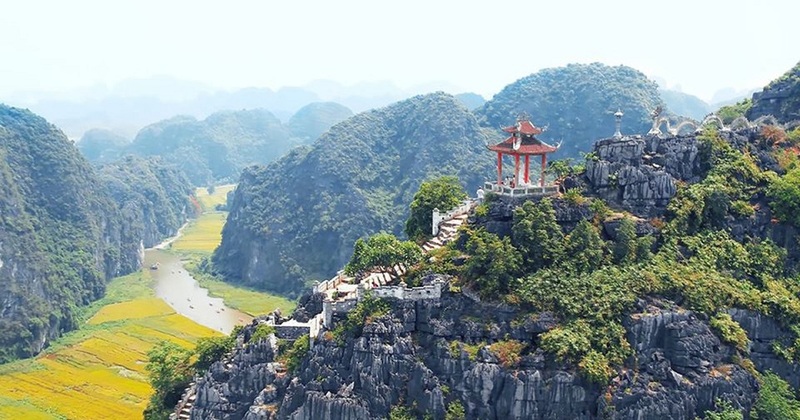 If you are searching for several destinations to go during your North Vietnam tours, you probably hear a lot about Ninh Binh province; which is undoubtedly judged as “ Halong Bay on land”. More and more foreign travelers flow to Trang An, Tam Coc – Bich Dong which are the most famous sites in Ninh Binh Vietnam. However, besides these sites, you shouldn’t miss paying a visit to Mua Cave Ninh Binh. Being less famous than Trang An and Tam Coc, Mua Cave brings itself harmonious beauty that really captures the feelings from hearts of travelers having been here. 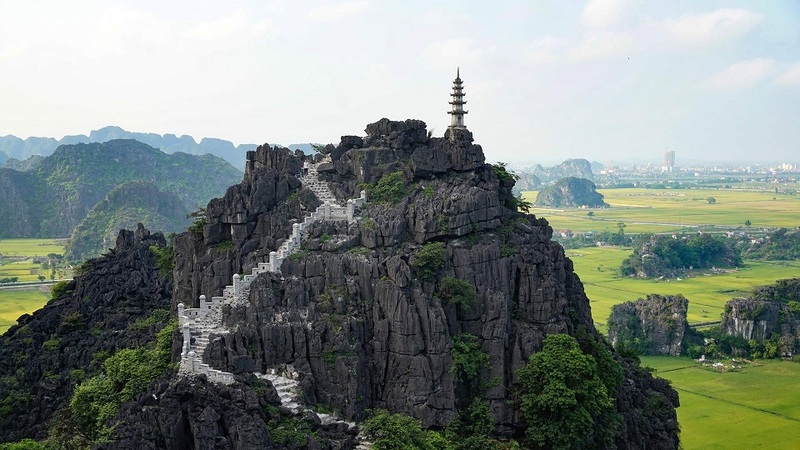 Travelers who have been here also call the beloved destination “The Princess of Ninh Binh”. 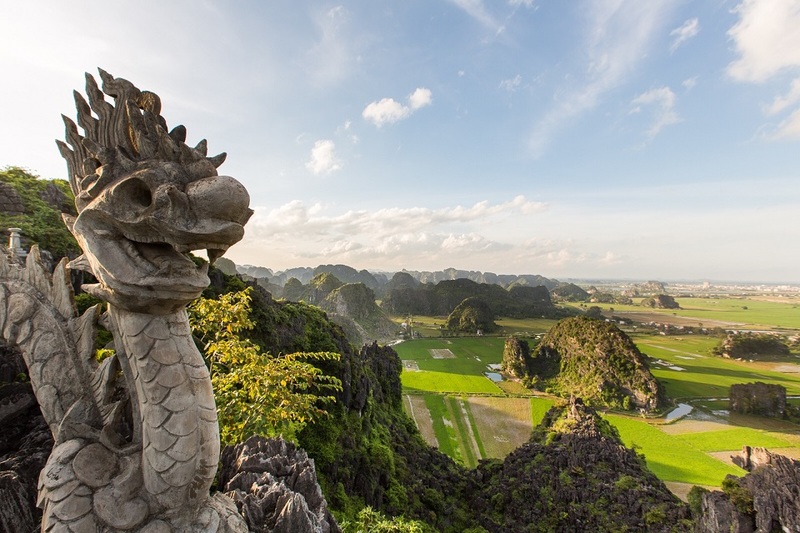 Standing on the top of Mua Cave, you will be given a great viewpoint to admire the stunning panoramic view of Tam Coc. Therefore, note it down in your Northern Vietnam itinerary and check it out right after you have a chance. Known as “Hang Mua” or “Mua Cave”, the destination has been popularly mentioned by Western visitors on social networks as well as personal blogs after their North Vietnam tours because of its picturesque mountain scenery. Particularly, Mua Cave is located at the foot of the mountain which is a big upside-down bell-shaped, estimated about 800m2 in size named Mua (Dancing). From the bottom of the mountain, you can see clearly the white stone steps leading to the summit of the mountain. The two sides of the staircase are carved sophisticatedly on the stone with dragon and phoenix images; that are typical for the Tran architecture. Unlike other hustle and bustle tourist hubs in the area, Mua Cave has a charming and peaceful traditional beauty that is hard to be found anywhere else. Being put into exploitation early, the services for tourists here are orderly clear; therefore you can avoid being under jostling, scamming. Presenting the exclusively cultural values, traditional performances that recreate the ancient kings’ daily scene in the tourist area are one of the special highlights to preserve the nation’s thousand-year culture. Besides the natural values of spectacular scenes, Mua Cave history also contributes significantly to the value of this site in general. According to Vietnamese legend, King Tran established Am Thai Vi located on the top of the mountain on his visit to Hoa Lu, which is the old capital of Vietnam. Since then, the King often came here to relax, sightsee and enjoy the dancing and singing performed by the odalisques. Therefore, this place was named the Mua cave meaning literally “Dancing Cave”. Mua Cave is located on the plain, surrounded by hills and mountains; that make Hoa Lu as both a good shield and prosperous agriculture of wet rice. From that point, you can partly guess the reason why Mua Cave used to be the capital of Vietnam under 2 dynasties of Dinh and Tien Le. In addition, Mua Cave also reflects religious values, especially Vietnamese beliefs, and Buddhism. Getting into the cave, you can explore the practice of worshipping “Tiger” which is very common in East Asia. 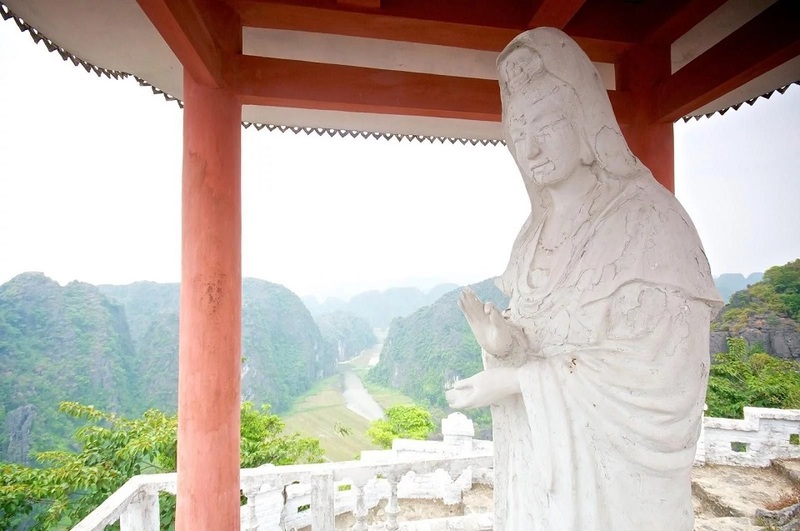 Furthermore, you can see the statue of Quan Am Bo Tat (the Goddess of Mercy) is looking toward the old capital of Hoa Lu. 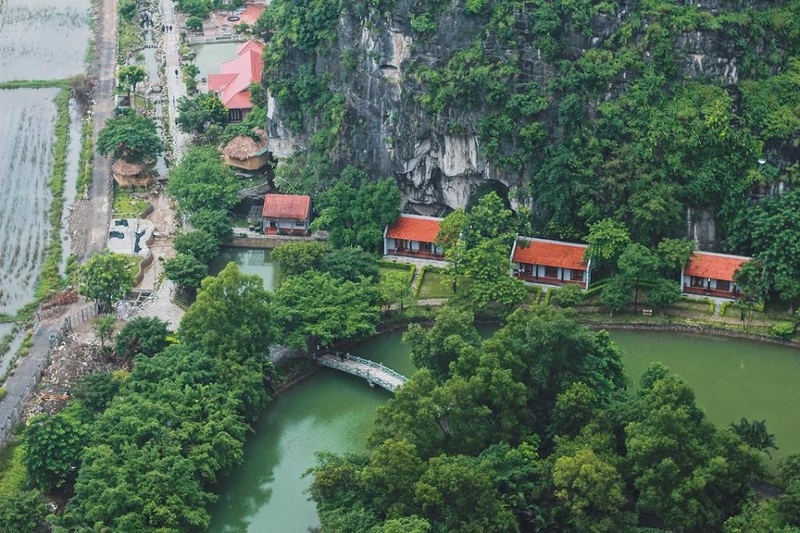 It is interesting that although the charming destination named Mua “Cave”, what attracts travelers the most is not the cave but the conquering of 500 stone steps to the peak of Mua mountain to ultimately enjoy the whole beautiful scenery of Tam Coc. The way leads to the top of Mua Cave was constructed under the inspiration of the Great Wall in China; with nearly 500 steps up to the top of the mountain. 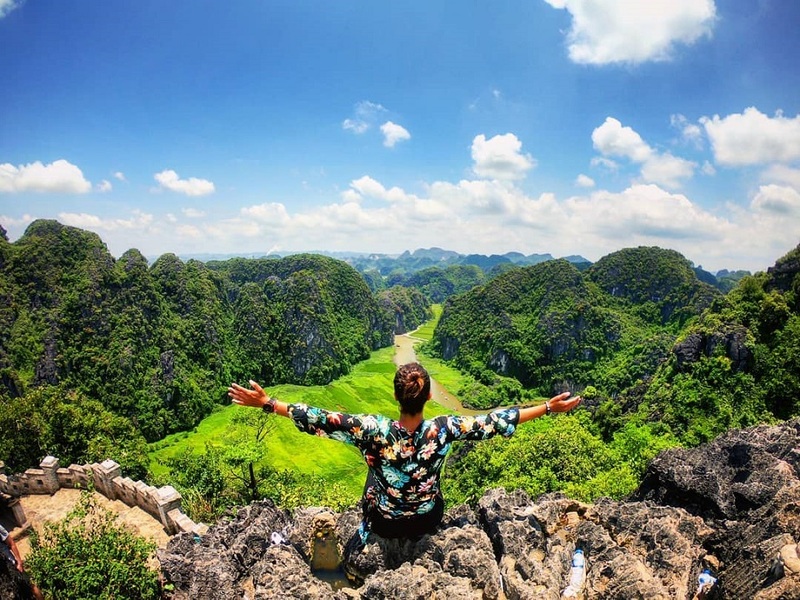 It is a hard trek up with many of its uneven limestone steps, especially at the top poin; but worth your conquering efforts for an impressive panoramic view of Tam Coc, Trang An and Ninh Binh city when you reach the top point of Mua mountain. Take your leisurely trek up with care due to steep steps on the way. From the highest peak of the mountain, the breathtaking landscape will blow the pickiest minds. The entire landscape of the field is captured along the wandering river with some lovely touch of local small boats. 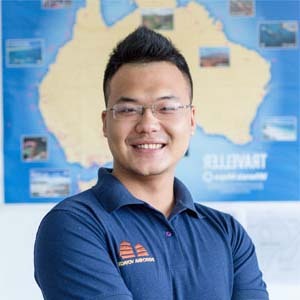 As far as the eye can see limestone islands rise majestically from the land, what surrounds them is not endlessly boring water; but a patchwork of perfectly laid out paddy fields, small picturesque villages, fields of grazing animals and rivers winding. If you decided to pay a visit to Tam Coc – Bich Dong, don’t forget Mua Cave – the princess of Ninh Binh. Go to the top and experience wonderful land appearing under your eyes. Mua Cave is located on the foot of the Mua Mountain that lies approximately 100 km south of Hanoi. It is easy to arrive here by taking a 2-hour trip by car, bus, coach, motorbike or even boarding a train from Hanoi. Moreover, If you are enjoying your North Vietnam tours in Halong, you will travel nearly 200 km to get the Cave. The price for taking coach is about VND65,000 (approx US$3) from My Dinh or Giap Bat station. Another option suggested is you can book a ticket of the shuttle bus, private limousine car at The Sinh Tourist, Futabus, Interbuslines, etc. The ticket price is higher but more convenient. You can take a train to Ninh Binh at Hanoi Station (120 Le Duan street). The train starts daily at 6.00 – 6.15 am and arrive at Ninh Binh station after 2 hours. From there, you can take a taxi to Mua Cave. For staying, you can choose to stay at the Mua Caves Ecolodge with great accommodations and service or some lovely local homestay in the area. On the other hand, the Ecolodge also provides other options such as villas for a big group guest. With its rural landscape, Mua Cave reflects the image of an authentic North Vietnam village. Its tile-roofed houses, green bamboo hedges, lush paddy fields, and cultivated vegetable gardens bring a peaceful and slow lifestyle; which would be wonderful for those who is seeking for a relaxing stay. Staying here, travelers have a chance to discover authentic Tonkin citizens life and to learn more about green and cultural tourism; that will be one of the memorable things in Vietnam tours. The Mua Cave entrance fee is VND100,000 (approx US$4) if you don’t stay at Mua Caves Ecolodge. If you are already staying there then it’s free. Moreover, in accordance with the spirit of solidarity projects, most the employees at Mua Caves Ecolodge are local people living in the nearby village. Visitors are more likely to treat as dear friends rather than guests. Mua Caves Ecolodge, a charming resort with a quiet atmosphere and comfortable accommodation, is truly a place where the human relationship takes precedence over the quality of services. 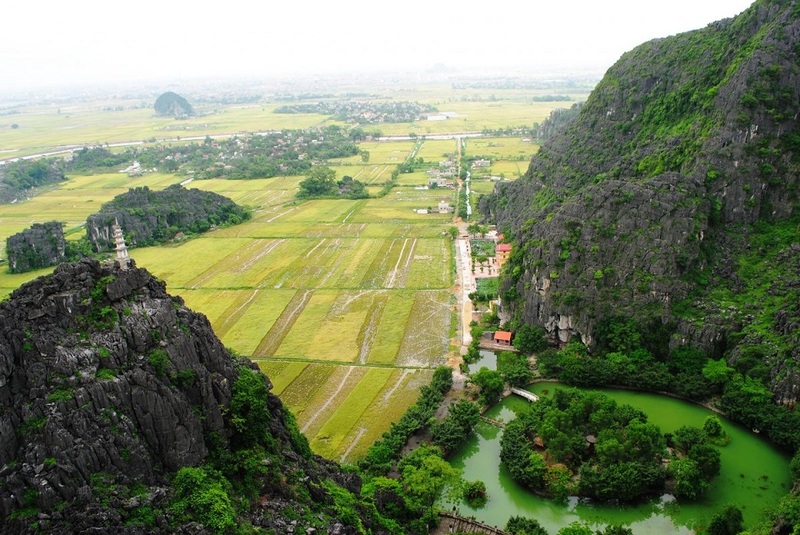 For wonderful panoramic photos of golden paddy fields and limestone mountains, you’d better arrange your trip to Ninh Binh & Mua Cave during its “Golden season” which is between late May and early June, sometimes early in May when the rice is getting ripe and changing from green to beautiful golden. The attractiveness of natural scenery is undeniable from the top of Hang Mua. The best time to hike the Mua Cave Peak is the early morning. You should start at 5 a.m – 6 a.m to capture the magnificent sunrise view. The sunset is also great but doesn’t try to hike after 4 p.m and leave early; because it will get dark really quick which would be quite dangerous. Don’t forget to bring your hat, water, some light snacks and maybe handy fan; since it is really sunny and hot in the summer. Even if it’s not summer, you shouldn’t let yourself dehydration. Wear sportswear and sneakers (trainers) which suitable for trekking. Plus, you would want to wear bright colors to have the best photos on the green-yellow-gray background of nature. Finally, don’t forget to bring your BEST camera and several memory cards; you would want to capture everything on your way. Attractive, but less touristy than other destinations in Ninh Binh, Mua Cave will meet all criteria of an ideal place for your North Vietnam tours. So why not Mua Cave Ninh Binh? Give me a reason.